This warning follows a number of days of forecasts of MODERATE air pollution in Liverpool and Manchester for Sunday 20 May 2018. “Multiple forecasters are predicting MODERATE air pollution in Liverpool and Manchester on race day. “Air pollution is already rising in parts of those cities with levels expected to exceed one or more guidelines set by the World Health Organisation to protect health over the next 24 hours. “Runners may experience unexpected symptoms that are not directly heat-related. These could include feeling sluggishness, shortness of breath, tightness of chest or coughing. There is no ‘safe’ level for exposure to air pollution and everyone is affected to some extent. ‘Air pollution protocols’ should always include the detailed tracking of air pollution levels by organisers and appropriate health advice to participants, referring to the additional risks of air pollution, in good time before the race. “Runners are encouraged to follow official health advice and be prepared. Asthmatics, for example, should carry their medication. Any specialist Medical ID should be worn e.g. bracelets or ‘dog tags’. “Defra breached the legal requirement to warn people about HIGH ozone air pollution on Bank Holiday Monday – the day of the Milton Keynes Marathon. Defra’s new website continues to hide vital information that would help event organisers and participants. 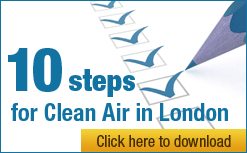 Clean Air in London (CAL) received a London 2012 Sustainability Ambassadors Award for commitment to tackling air quality, climate change and sustainability issues during the London Olympic and Paralympic Games in 2012. Since then CAL often checks forecasts of air pollution before major sporting events and notifies organisers and others if an air pollution episode is likely to occur on race day. Broadly speaking, MODERATE air pollution bands start around the World Health Organisation guideline level for individual pollutants. CAL issued #CodeYellow alerts to the organisers of the London Marathon, Milton Keynes Marathon, Rock and Roll Liverpool Marathon and the Great Manchester Run in 2018. These were for particle or ozone air pollution episodes. All four forecasts correctly predicted air pollution around WHO guideline levels on the day at local ‘background’ monitoring locations i.e. as part of major episodes. Be prepared. Air pollution can kill. People should be kept safe and have fun! Organisers should consider whether their event should be postponed or cancelled. They should also consider a 630am start for future endurance events particularly between April and October (in the northern hemisphere) when pollution levels (e.g. ozone) and temperatures may be lower. An ‘after action review’ should always be undertaken to learn lessons for future years and share knowledge with other organisers. Adults and children with lung problems, and adults with heart problems, who experience symptoms, should consider reducing strenuous physical activity, particularly outdoors.